MoneySuperMarket have launched a new Home Improvement Hero competition for bloggers to show what they can do to improve the look and feel of a room on a low budget. I would love to be showing off how I have used my 50 pounds budget to add some lovely final touches to a room and end up with a great atmosphere, but instead I have had to put the budget towards proper DIY and home improvements, as we have had quite a bit of work and a few disasters here over the last couple of weeks. At first we had to have a new boiler put in, as it was declared to be dangerous and an at risk boiler. We had loads of people round to give quotes and some of them have given suggestions involving ripping up loads of floorboards, moving everything all around and new pipes coming through everywhere which sounded a total nightmare considering I still need to live in the place with the 3 kids while they are doing the work! Luckily we finally managed to find someone who could do the job a bit more simply, keeping the boiler in a similar location to avoid quite so much of the new piping and work throughout the whole house. While getting the new boiler, we had the old water tank thrown out, so we took the chance to get more shelving put into the cupboard where it had been. While we were having that done we decided to get the under stairs area shelved too which is great – to make the space more organised! This was all brilliant and I was really pleased with how my improvements were coming along – until a couple of days later we noticed water was suddenly leaking from somewhere in the bathroom down to the entrance hallway. 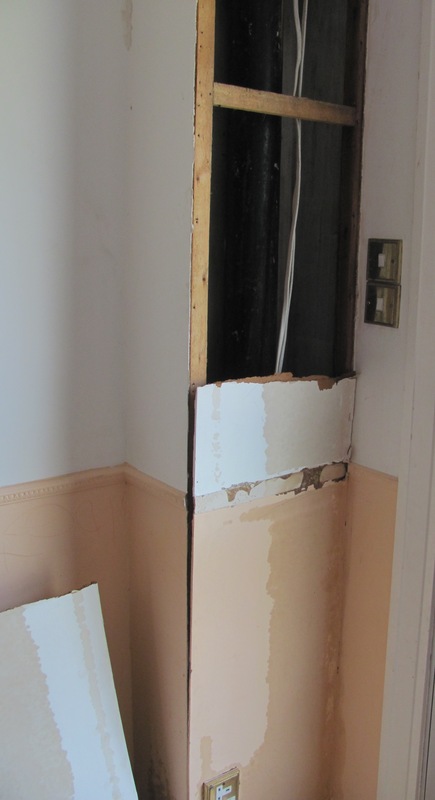 The whole place was soaked and the wall was ruined as it got so wet that most of the wall panel came off, exposing all the pipes and wires underneath and not looking very welcoming to the home at all! To make matters worse, when the plumber came to investigate it, he had to smash up all the bathroom tiles to get to some of the pipes to have a proper look. He also had to move around so many furnitures in the bedroom because one of the walls joins to the bathroom and that is where the pipes were running. We found that our pipes were all so old that having a newer boiler with a slightly higher pressure had been too much for them. They had holes in them which had been only blocked by lime scale! 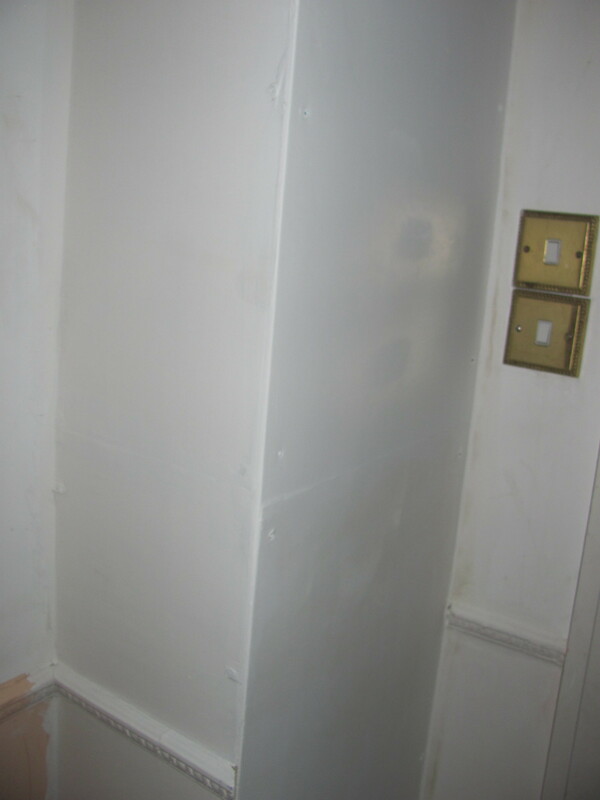 The higher pressure water was being pushed through causing it to leak everywhere and leave the house in this state! The plumber managed to fix it with new pipes, but we were still left with a damaged house to sort out. The insurance excess would have been quite a lot so we decided just to sort it out by ourselves. We are now going to repaint the whole corridor in white,using the rest of the left over paint. This will be good to freshen up the area as I never liked the orange colour on the lower half of the walls. It was left by the previous owners. 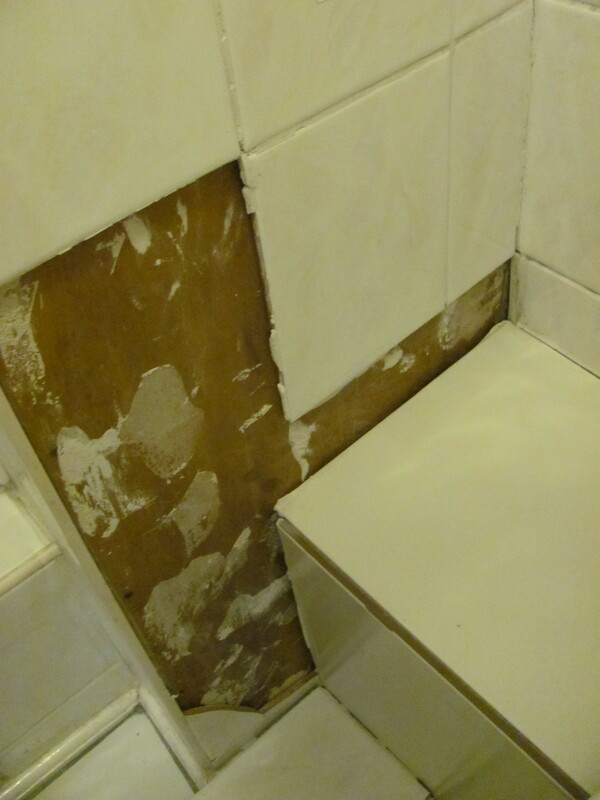 We also had to re-tile the bathroom to fix what had been smashed. We had just tiled the whole floor last year, as we bought the house with carpet in the bathroom which is not good as it will get damp. We were able to reattach some of the previous tiles, but not all of them. We just selected some cheap plain white tiles from Wickes as it will match with the others and do the job. These were bought within the last £10 as we could reattach most of the old tiles. This is still not quite finished, but it is on the way there. At least having to do the downstairs hall way will give us an excuse to get it finished off the way we like it, as it had been not been left in the best way by the previous owners and there are a few things I would like to change to make a much better welcoming impression! 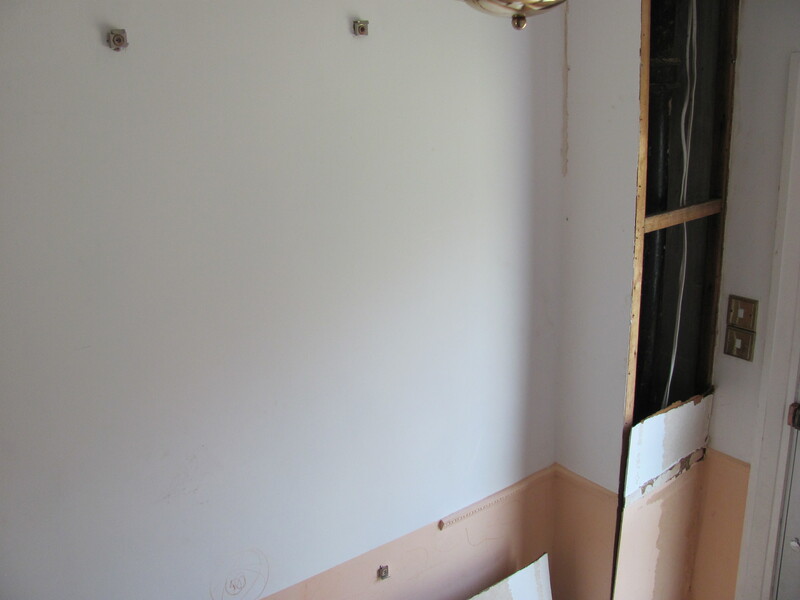 Here you can see a wider shot of the damaged area, and the place to the side is where the previous owners had ripped out a fitted mirror which we need to replace. I will need to remove the dado rail from the wall too as they have left it with a gap in it. 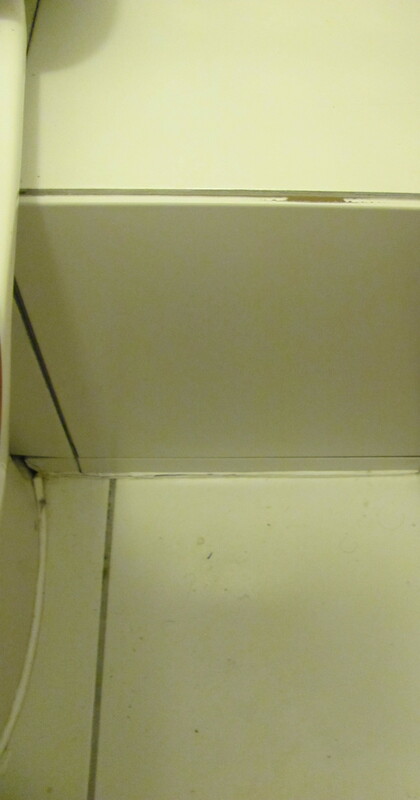 I had been trying all this time to find a ready made mirror to the correct dimensions for the gap, but no luck so far. 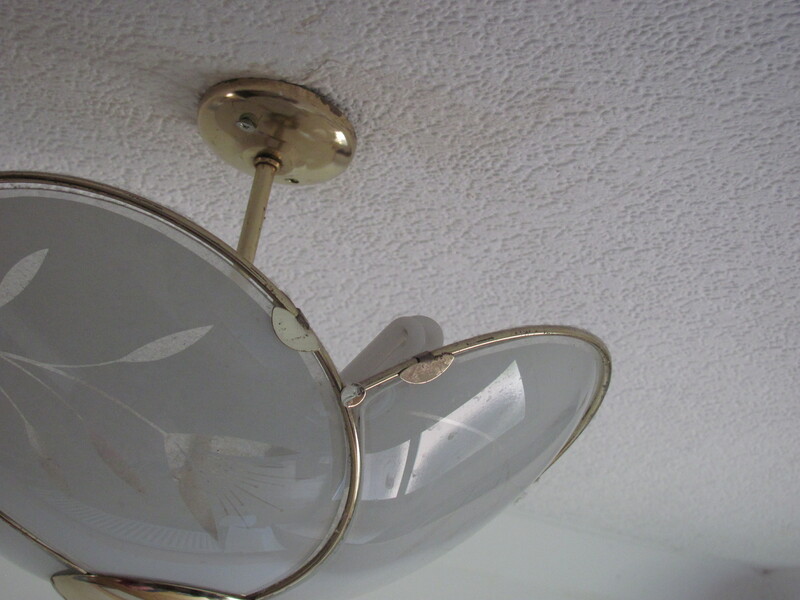 Here you can see it coming away from the ceiling, and look how old fashioned and unstylish it is anyway! It will take more than this 50 pounds budget to complete all of this though, but we will continue to work on it over the next couple of weeks. I will update with some pictures once the whole renovation is finished! The budget has been enough for us to make good the damage, which is the most important thing and from here we will take it a bit further and get it all looking exactly how I would like – finally! Sometimes it does take a disaster to give you a kick to get it all sorted out! What a nightmare with the leaks – glad you’ve managed to get it sorted and done some good improvement to make things look better. Hope you get it all the finishing touches you want done soon. glad you have sorted your boiler!